Robots may be able to track and protect herds. With all the environmental problems posed by global phenomena like climate change, it’s easy to forget that other, more directly man-made threats endanger animals. One such problem is the illegal wildlife trade, which is estimated to be a $19 billion business worldwide. One of the most at-risk animals is the rhino, but you can’t exactly protect rhino herds 24/7. That’s why a mechanical engineer has a wacky new idea: robotic rhinos. These babies could stay with and track rhinos, and alert patrols when poachers are nearby. The illegal rhino trade is a big one: at least 5,940 African rhinos have been killed since 2008, with 1,175 being killed in 2015 in South Africa alone. The main reason they are poached is for their horns; street prices for a rhino horn in Asia was $60,000-100,000 per kilogram in 2013. To combat this, the robo-rhino concept was born. 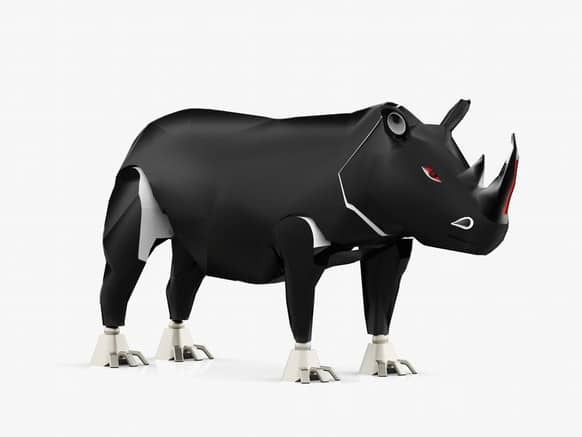 Called Rakamera, its basically a robot that would mimic rhinos so that herd would accept it, and it can monitor them from the inside. The undercover bot would be powered by hydrogen fuel cells, and would have internal hydraulics and servomotors for locomotion. It could be outfitted with infrared sensors and cameras to track both the movements of the herd and any human activities. On a more conventional note, anti-poaching groups have taken to using infrared cameras, UAVs, spatial monitoring tools, and many other high-tech devices to catch criminals. These are most often used to track humans who get too close to protected areas. Ultimately, the solution will have to come by way of destroying the demand. Myths of the curative properties of these horns will have to be dispelled, and people must be taught the value of wildlife conservation. Until then, technology will have to stand guard over our animals.